Ever since I spent an afternoon crafting and card making with my friend who introduced me to stamps from Victorine Originals, I've looked for reasons to buy some of their stamps. I went on a spending spree right after I discovered them and now have stamps by them for most holidays or at least seasons. For this card, I combined two totally unrelated stamps but I thought they made a great Halloween scene right out of a Dickens or Poe novel. What do you think? Can't you just imagine an old, Victorian hearse on its way to the cemetery right at sunset with the bats swooping past? The "hearse" stamp is actually called "Buggy" and the bats stamp is called "Flying Bats" (I think -- not sure as I borrowed that one from my friend and the name is a bit worn off.) I used both stamps as silhouettes, stamping them with Tuxedo black ink. I used my ProMarkers to color the sunset sky. Then I started digging through my stash of paper scraps, building layers in alternating dark and light shades of autumn colors as I went. I put everything onto a colored card blank, including the textured ribbon wrapped around the card front. The sentiment is another Victorine stamp, also colored with ProMarkers, then hand-cut and mounted on dimensional dots. Beautiful creation, some gorgeous stamps, fabulous scene and wonderful colours. Your sky turned out gorgeous! I love the scene you described and I can just picture the bats flying over the hearse! Great narrative!! I love the scene. Great sky too. So glad you joined us at Morgan's ArtWorld. Oh WOW! Connie this is fabulous! Love the scene and I really can imagine that. Perfection! Well, you definitely created a spooky scene! Your sky is fabulous and the die cuts you used really finish everything off perfectly. Thanks for playing with Di's Digi Designs and Jo's Scrap Shack. You have created a atmospheric scene with all the right ingredients for our Halloween theme at Allsorts this week, many thanks for joining in. AM-AZE-ING, what a Super card, so well thought out and designed. Love it. This is a beautiful card! I love the gorgeous scene you created and the black silhouettes fit perfect for this! It actually reminds me of the old Amish country back roads in PA. Lovely card! Thank you for also joining us at Jo's Scrap Shack and playing along with us this week in our FFC! Have a wonderful day! 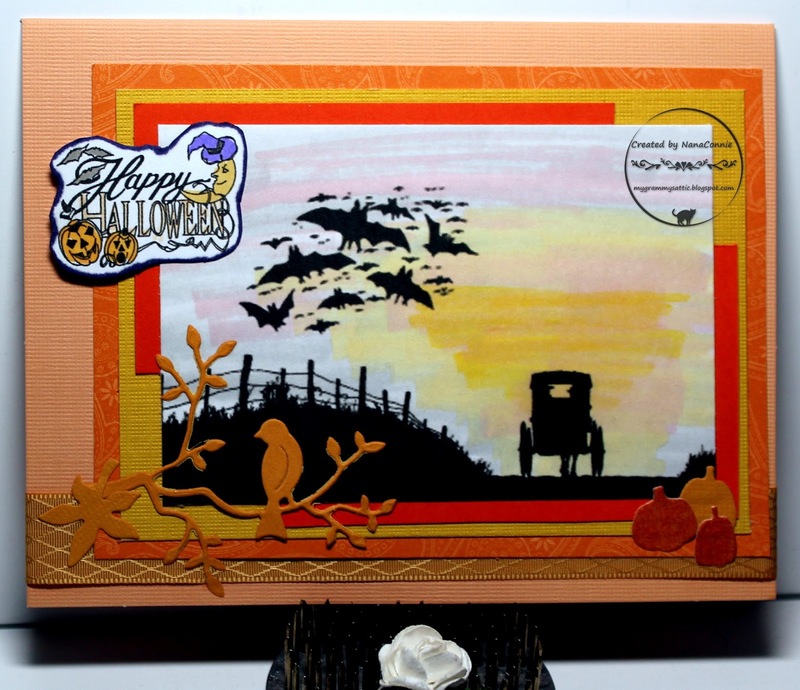 Great card, love the bats stamp, a perfect scene for this weeks challenge. What a unique card! I love that you used totally unrelated images and got them to mesh so well. Thank you for joining us at Victorine Originals/SumMore Fun! Wow, this is great, what a fabulous scene, very Halloween. Super! !